Susan Kendrick is an accomplished canine coach, credentialed through the Certification Council for Professional Dog Trainers® (CCPDT®) and a hand selected member of the globally recognized Victoria Stilwell “Positively” Dog Training team – the world’s premier network of professional positive reinforcement dog trainers. Susan is also a member of Central Florida Force Free Training Network – a professional network of veterinarians and trainers who study animal behavior using positive learning connections, not pain or fearful tactics, to teach dogs. My husband calls Susan the "dog whisperer"! Dexter, our Chihuahua puppy, immediately responded to her training techniques. We loved our private lessons so much we enrolled Dex in a group session! She works with dogs or cats and their owners to establish successful solutions to overcome unwanted behavior and to build a stronger, respectable relationship between the two. From new puppy or kitty coaching to aggression issues, Susan continues to stay current in the subject of canine and feline behavior. 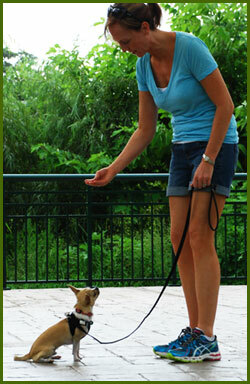 She creates enjoyable and results based training experiences for dogs, cats and pet parents alike. Certifications? It’s downright dangerous (and inhumane) to use anyone who doesn't offer them. Dog training is an unregulated field. Pain and fear tactics have no place in true learning. They are a quick fix and often lead to increased behavior issues. Quality certifications ensure that you are putting your trust and your pet’s well-being in truly capable hands. A certified trainer who continues to maintain her certifications and CEU’s means you are getting someone who is using the latest proven rewards based methods … which can cause everlasting, positive results. Susan uses her deep understanding of human and canine needs to connect with both owners and their dogs to create a positive, results oriented and fun training experience. No pain or fear tactics are ever used. She is dedicated to maintaining the highest level of professionalism and expertise, while following the latest in the ever-evolving field of animal behavioral science.